HAving finally gotten time to fly I just had to take out the new toys. However the wind wasn't cooperating. 0-1 steady with occasional gust to 2 mph. I had to try the UL anyway. here's a pic. I won't go into the construction because there really isn't any need to. Pam and Mike at heads up kites do fantastic work and their well known for there history with many different kite makers, Jons attention to detail on the build is second to none and Wayne's flare for sail graphics always shows up with an eye pleasing design (and yes the spider legs influence still shows ). The new addition to the team can not be over looked either though. Devin's work on tuning the final production version has made the solus an amazingly agile and responsive kite for such a large sail. According to my conversation with Jon Devin had full freedom with the final tuning so my hat goes off to him for a great job on his first kite build (I'm sure Devin will give credit to Jon for what he learned as well). THe only thing I find worth mentioning is the stitching. This kite has a serpentine stitch instead of the usual 3 step zig zag which adds a nice detail touch to the build. Having flown the prototype I can say the final version is improved a lot and well worth the price. Being crappy winds and well below the 2mph low end rating I figured I wasn't going to get any flying in. Winds were 0-1 gust up to 2mph but mostly a steady .5 mph. Pulled out the 50 foot 100# skybond line set (this line is as thin as 50# lpg line) and set up anyway with the bridle as Jon set it, 12g weight in the tail. My UL came in at 7.5 oz without the tail weight. 19 oz weighted. This kite is rated conservitavely IMO. IN 0-1 I was able to fly it fairly easily with the tail weight in and a little footwork. Its very floaty and very responsive. Axels and 540's with a simple wrist flick and a few pumps gets you back up. THe kite has very good drive but is a bit under powered as you would expect. HOwever, and surprisingly, take the tail weight out and you have a different kite. No tail weigh and 1 knot heavier on the bridle and this kite comes alive in 0-1 with virtually no loss in tricks except for the tricks I still can't do . Inputs on this kite are small. Wrist flicks for most tricks and finger tip fade control. With the few 2 mph gusts I had i can see the crisp precision this kite is capable of. SHarp corners, rail straight lines and nicely powered in the scant 2mph. Roll ups on this kite are a no brainer. Toss it on its back and it will go around, its that simple. THere is enough billow in the nose area that the kite will drive itself around and if the wind is light enough all you have to do is give good slack and it will multi-roll up on its own momentum. All the no wind SUL tricks are there. Pin wheels lock in so well you can drop the lines and let it go on its own. Up and overs were tough on the 50 foot lines but doable. THe kite floats so well that super flat axels , 540's and backspins are done easily without losing altitude. JL's are doable in 0-1 but I haven't quite figured out the flare to fade input it needs. I'm still tuning down my inputs from flying my saber 2 to the small, light, smooth inputs this kite asks for and I tend to get a pop up instead of rolling to a fade. In the wind I had I would put this kite on par with my Vapor SUL in basic tricks and flight performance needing just slightly more footwork to keep drive in the sail. I Will definitely have to make up a set of 30 foot lines and try this kite indoors. Sounds like a great low wind performer. I would love to try one of these or the standard out - anyone in the Seattle are have one? Our winds here are often pretty low as you describe - I always welcome a kite that flys reasonably well in that wind and can still readily yoyo. It is. I Was really surprised at how well it flew in next to nothing. THe only reason I knew there was air movement is the sweat on my back was cool . I let George have a go and he managed a single pop triple roll up unintentionally when he tried a backflip. THe kite just went around and it rolls around a point just above the center T. Very little movement away from you, maybe a single step if its a bit more powered up. The nice thing is you don't really notice much difference without the tail weight other than a slight bit more effort to keep drive in the sail and slightly faster pitch. I let George have a go and he managed a single pop triple roll up unintentionally when he tried a backflip. Be advised that the hyperbole police are in operation in this area. I look forward to the forthcoming video of this event. As soon as I can tame my input down enough to work this kite like it should be and get some time I'll get a vid made. Hard part about that was actually stopping the roll. I think we were both too surprised at how easily it went around to think about that part. Between this and my saber 2 the inputs are worlds apart and my saber has been my go to kite for the past 3+ months. Heyas Mark looking forward to your thought on it and seeing how it looks in your team colors. I'm loving the UL so far and just waiting for wind to fly the Std more than 5 min lol. I figured sence I now have the time to comment on this, I'm going to! Getting back from SCHOOL at roughly 1130pm is ALWAYS a good time, especially on a saturday. BAH! Ike, thanks much for your views on the Solus UL so far. To you and ANYONE else please please please keep'em coming! I'm really curious to hear everyones opinions because I'm not in Michigan anymore with the new school year and all, and I am pretty out of the loop with kiting so I use this place to kind of keep myself updated. 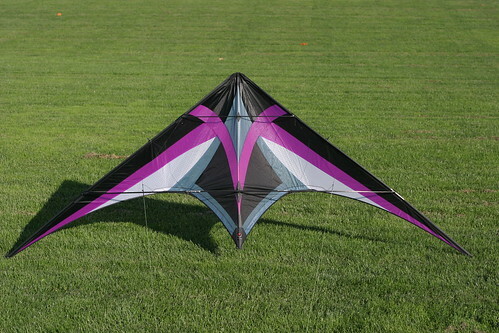 My goals for the Solus's were to have a kite with a big wingspan that has a big presence in the sky, but I wanted to have a kite that was fun and very easy to knock around and snap a corner out of with small inputs, especially on higher wind days. That was basically my main goal for the standard the whole time. Big kite= Big fun & Less work(inputs)=More time flying(more fun) was logic at least. I'm confident this will come through in the kite's characteristics, but I'll let the kite speak for itself. As for the UL, a HUGE thing I kept in mind (well before we even had one going) was how much I wanted it to roll up in one pop, be able to stay really flat and floaty, and most of all still be able to take a strong gusts of wind, much like the UL Ocius on the skyburner line. Zach Gordon and I have flown UL/Std (I flew my UL, he flew my Std) pairs in 12-14 MPH on the night of the night fly at Two Rivers for about 45 mins before it stormed. The UL held up well, so that was more or less my final reassurance that the kite was the way I wanted it to be, especially after not being able to fly them for awhile because school had started for a bit. Also, Jon and Marieannes help/support through this one 1 year+ process has been awesome, and I can't thank them enough for all the things I've learned about kiting and how kites really work (in the air) through this whole thing. I also wanted to thank Mike and Pam for doing the sails on these kites and Jon and Marieanne again for all the fantastic tubes that are used in this kite. All of Jons advice on the this whole adventure have been documented in a kiting binder that I now started and will be used later on after I'm done with school and have a job. The dream is to play in a contemporary orchestra (or classical symphony orchestra, as those groups are kind of hard to make a decent pay on) as 1st horn, and after I gain tenure in the orchestra then I'll hope to open my own hand made kite company, but thats years down the road. All of this info has been fantastic for this goal. Anywho, just figured I'd post something kinda quickly to say thanks for the posts and all that jazz! If anyones headed to KP and has a Solus, send me a PM and maybe we can fly pairs or team or something along those lines (no pun intended) in the early morning or later at night or something! Can't wait. Also, Mr. Lummas, I'm very interested to hear your opinions of the kite from a professional pairs/team prospective. Hopefully I'll get some more experience with these in a team setting on thanksgiving break in a month or so! For those of you that already have a solus here's an update for you. I just got an e-mail from John letting me know the upper spreaders on mine were cut long. We have found that we cut the top spreaders too long on both the UL and Standards Solus's that we sent you. They need to be cut at 21.75" or 55.2450 cm. The current length is 21 and 11/16. This does not seem like alot but we feel it makes a big difference in the way the kite fly's. It may seem funny to pull the nose in this much, but the difference in the way the kite tracks and tricks is much better. So the new length is 21 and 11/16. Thats about 1/2 inch shorter than the US on my UL and about 1/4 shorter than my Std so check your spreaders and cut em accordingly. I've been enjoying the kites as is but made the adjustments anyway and will post back if I notice any differences. This really makes no sense at all. You're saying that the current length of 21 and 11/16ths inch is too long, and to fix it you suggest a new length of 21.75 inches, which is actually longer. The difference (to me) is pretty big. Mine had the short upper spreaders in them but when I went to school, I guess the measurements were off a little bit. Sorry for the confusion everyone. Yes, the real spreader size is SHORTER than what has been cut, so just hack off a little bit to the given length and you're set to go! 21 and 11/16 is the new length(current being used on new batches). Mine were 22 and 1/8 UL and 22 Std. The quote was from the e-mail Jon sent me. IF your using a cut off saw or shaft cutter with a 1/8 inch kerf blade then if you cut at 21.75 you end up with 12 and 11/16. Got to test out the UL with the the right upper spreader length yesterday. As I mentioned before I had to cut just over 1/2 inch off. The difference is substantial. It flies better at the low end with more drive in the 1mph range, tracks smoother and you get a bit more from each pump. ROll ups are noticeably faster. spins seem a bit easier and the dead spot in the flare to fade is not nearly as bad. I got stopped by the hyperbole police once .... well at least that's what they say ! I have a std and a ul customs in the works now stand by..
YOu won't regret it its a fun kite. Toss up some pics when you get a chance. I haven't added to this review for a while and I should note that when I got mine it was in the batch that had the longer US. Since I've cut it to the right length and have had a good chance to compare the difference I can say it has lost a slight bit on the low end range. Tracking and precision is improved but it now likes at least 1 mph with the weight in on 50 foot lines. ROll ups are still there but not as easy and you can still fly it in less than 1 without the weight but its more work and not as tricky. Its still floaty but the window below 2 mph is a lot more vertical than before. The sweet spot for this kite really does start around 2-3 mph and tops around 10 for most tricks.